In 1977 George Lucas released the original Star Wars film, a film about rebels overcoming an evil Empire and the evil Darth Vader, with its famous scrolling opening telling the story so far, to an unsuspecting public. No other title except ‘Star Wars.’ And at the time people assumed this was the whole story in one film. And then in 1980 and 1983 came two further films in the series, completing a trilogy. But the most interesting thing was that, when the original film was rereleased in 1981, the mysterious words ‘Episode 4 – A New Hope” appeared at the beginning. Star Wars Episode 4 – A New Hope. Episode 4? Must be Episode 1, surely? Because everyone had thought the first Star Wars film was the first episode in the story – now it seemed there were three episodes before. Except no-one knew what they were until years later when George Lucas finally got around to making his second trilogy of films, which was really the first trilogy. And having revealed that he had originally had nine episodes in mind, everyone had given up hope altogether of seeing the end of the story as there were no signs that the final three films would ever be made. George Lucas himself said that they would never be made. And then came the big announcement last year that finally the end of the story will be told in a final trilogy of films to be released over the next few years. But let’s go back to that original trilogy. For the titles of the three films could almost be used as titles for the events that we are recalling and reliving over the next few days. But first to Holy Week. Each year we know that Holy Week is approaching, that this especially solemn time in the Church’s annual celebration of the life of Christ is close, because we have veiled all the crosses and pictures in the church. No-one quite knows for certain the origin of this practice, but it probably began in Germany in the ninth-century as a way of making sure that the often illiterate faithful new that it was Lent. It used to begin on Ash Wednesday but since the 17th century has been confined to Passiontide. And although in one sense we no longer need a visual reminder of where we are in the Church’s annual story of Jesus, psychologically it’s a good reminder that we are now in this most difficult period – Passiontide and Holy Week – as we struggle we the realities of sin and death and the work of Redemption wrought by Jesus on his cross. And it all begins here. Just like Star Wars Episode 4 – A New Hope. We could almost have our own trilogy and call this ‘Messiah 4 – A New Hope.’ For we know a lot has gone on before this point in Jesus’ life as he arrives in Jerusalem on a donkey – this isn’t the beginning of the story. There has been Episode 1 – The Foretelling of the Messiah. There has been Episode 2 – The Coming of the Messiah. There has been Episode 3 – The Ministry of the Messiah. But here we are at ‘Messiah Episode 4 – A New Hope,’ because for the people the events of that Palm Sunday meant new hope, and they shout and sing at the arrival of their new king, expecting that he has come to overthrow the Empire. We began our worship this morning with the hymn “All glory, laud and honour” – a hymn which is over a thousand years old and which is traditionally used during the Palm Sunday procession as we wave our palm crosses, much as the people of Jerusalem would have waved their palm branches centuries ago. We identify with the enthusiasm of the crowds at Jesus’ triumphal entry into the city gates, riding on a colt. It was a festive occasion. Not everyone that day, however, was in a festive mood. The religious authorities of Jerusalem, both the lay leaders and clergy, sensed trouble in the making. ‘Star Wars – A New Hope’ was followed by ‘Star Wars Episode V – The Empire Strikes Back.’ And just as in the film Darth Vader, apparently defeated in the previous film, makes a comeback, so here too in Jesus’ story the Empire Strikes back, mainly though those Jewish rulers who thought that keeping the Empire happy was the best course of action, and who didn’t particularly want to lose their own positions of power. And it’s the second part of our trilogy which we could call ‘Messiah Episode V – The Empire Strikes Back’ or perhaps, although it doesn’t sound as grand, ‘The Jewish Religious Authorities Strike Back.’ And this part of the story begins today and unfolds over the next few days before reaching its conclusion on Good Friday. And in a way Jesus made it easy for them. Jesus did not conduct his ministry with an eye to pleasing the crowds. He didn’t come to make us happy – he came to save us, to pay the price for our sins, and to show us how to live and to show us the way to heaven. He never intended to be a crowd-pleaser. A man who wants to conduct the orchestra must turn his back on the crowd. When Jesus rode into Jerusalem on Palm Sunday the crowd cheered. The poor little donkey probably thought all the attention was for him. So, if applause comes my way, I know it’s really for Him [Jesus]. At parade’s end, it is my greatest joy to be one of the Lord’s little donkeys. I’m not entirely sure I feel like one of the Lord’s little donkeys, any more than you do, but I’m sure we all take his point. All that we do is not for us, but that the name of Jesus might be glorified. 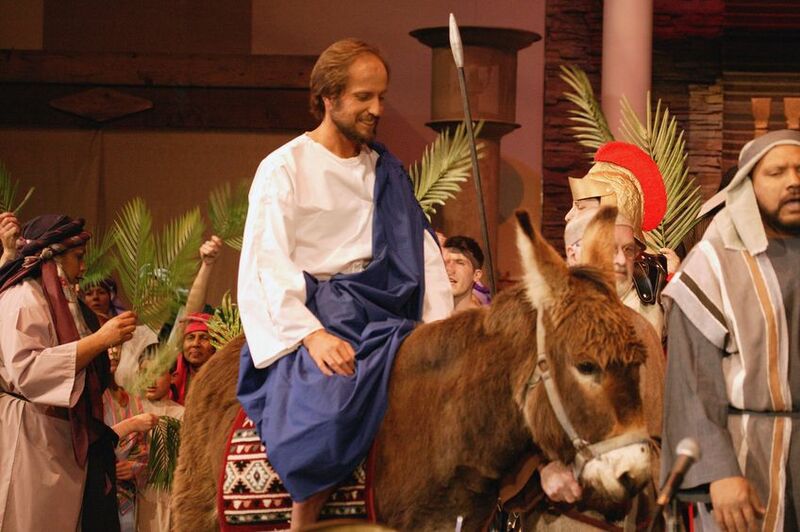 As the Lord’s little donkeys, we serve that Jesus might receive the praise. For, as with the original Star Wars trilogy, there is more to come. In George Lucas’s trilogy it was ‘Star Wars VI – The Return of the Jedi.’ When everyone thought that Darth Vader and the evil Empire had won, back came the Jedi stronger than ever and this time the defeat is for good. Except for us of course it’s Jesus who returns. For us it’s our own third part of the trilogy, ‘Messiah Episode VI – The Return of Jesus.’ But for that we must wait until Easter Day. For like the disciples we still have to journey with Jesus on the way of the Cross and live with him through pain, suffering and death. For unless we do so we can never understand what resurrection really means.